Deladris Green proved just how dominant he can be. In limited minutes is his return to the Redskin lineup from injury, the 6’6″ senior scored 23 to lead the Redskins to a 63-45 win over Perryton in the Big House. The Redskins led the Rangers 19-11 after one quarter after making their first three 3’s. LHS led 36-24 at the half. The Redskins led 49-32 after three. 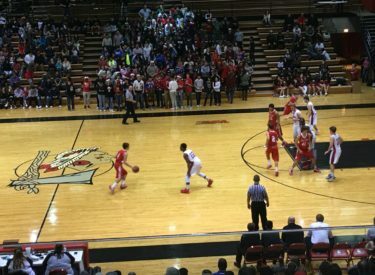 The Skins were 7-20 from three point range and 6-6 at the foul line while Perryton was 3-13 from three and 5-9 at the foul line. Cade Hinkle added 14 while Cole Evans and Kaiden Bigham added eight a piece. Liberal is 5-0 at Christmas break for the first time since the 2008-09 season. Perryton is 8-3. The Redskins play at Perryton January 3 at 7:30 on 1270 and kscbnews.net.